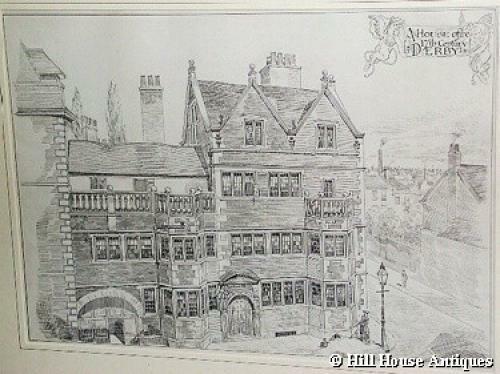 Rare original pen & ink drawing of a 17th century house in Derby by the celebrated architect, designer, writer and teacher, William Richard Lethaby (1857-1931). Signed lower right. Approx 21" by 26" inc frame. Lethaby was chief clerk in the offices of Norman Shaw from 1879 to 1889, when he set up his own practice amd was later President of the Arts & Crafts Exhibition Society. He met Ernest Gimson in 1889 and joined with him in the founding of the furniture makers of Kenton & Company. He also provided designs for Stanmore Hall which was being decorated by Morris & Co. Became Master of the Art Workers Guild in 1911.